U.S. Latinos have said job creation and fixing the economy is among their most important issues that should be addressed by politicians during the midterm election, according to Latino Decisions 2014 Election Eve Poll comprising of 4,200 voters. Another Latino Decisions poll about Latinos' views toward the economy found 61 percent of survey respondents stated the "American Dream" includes owning their own business, which is a view shared by 68 percent of foreign-born Latinos. The U.S. Small Business Administration (SBA), a federal government agency providing counseling sessions, loans, loan guarantees and contracts for small businesses, has recognized Latinos' impact on America's economy, notably within the small business sector and entrepreneurs. SBA Administrator Maria Contreras-Sweet -- a member of President Barack Obama's cabinet since April 2014 -- has also acknowledged the effect of Latino small business owners and entrepreneurs, who have contributed $468 billion of the U.S. economy, every year. Contreras-Sweet spoke with Latin Post during a visit to Brooklyn's Miti Miti Taperia in honor of National Small Business Week, which occurred between May 4 and May 8. Contreras-Sweet spoke about the SBA and its Latino outreach. The SBA administrator said the purpose of National Small Business Week was to honor and celebrate small businesses from their risks and pioneering in starting and expanding new jobs -- such as Miti Miti Taperia. Contreras-Sweet noted small businesses are creating two-out-of-three new jobs in the U.S., which helped the country's 61-consecutive months of job growth. "The impact of the Latino community is enormous," said Contreras-Sweet." What we see here is, particularly for example, immigrants are twice as likely to start a business, they're twice as likely to file a patent. Today, immigrants employ 1 out of every 10 employees.... It is important to recognize the contributions that immigrant populations are making." Contreras-Sweet also referenced a report that immigrants or their children founded more than 40 percent of Fortune 500 companies. According to the Partnership for a New American Economy report titled "The 'New American' Fortune 500," immigrants drive the economy. The report noted the immigrant-founded Fortune 500 companies employ 3.6 million workers worldwide, but the rate increases to more than 10 million when accounting businesses founded by children of immigrants. Contreras-Sweet added that as a result of immigrants "who are transitioning and learning the language of business, which is English," the SBA launched a bilingual website where Spanish-language counseling can be provided, including through mobile devices. Contreras-Sweet said she has heard the Latino community about a streamlined process including more places to find SBA loans, which resulted in a lending record that saw Latino small business loans increase by 22 percent across the U.S. While Latino American entrepreneurship has "risen substantially," problems remain including lack of funds and high failure rates. The Ewing Marion Kauffman Foundation noted Latino-owned businesses, along with black-owned businesses, have a higher failure rate than white-owned and Asian-owned business. 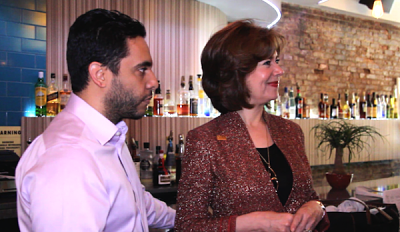 U.S. Small Business Administration Administrator (SBA) Maria Contreras-Sweet (right) next to Farid Ali-Lancheros, co-founder of Miti Miti Taperia restaurant in Brooklyn, N.Y., on May 7, 2015. Miti Miti Taperia was a recipient of an SBA loan and received a certificate from the agency for its contribution to New York City, creating jobs in the state and "inspiring the entrepreneurial spirit of the nation." In regards to millennials, which the White House identified as Americans born between 1980 and mid-2000s and representing one-third of the total U.S. population, Contreras-Sweet said the SBA has been working on a toolkit for the largest U.S. generation based on feedback from bankers. "Millennials have no boundaries. They're ready to innovate, to disrupt old industries, and there's a wakening, a movement taking place across the country," said Contreras-Sweet, later adding, "Millennials have this very special energy that we are trying to capture and so we've partnered with these new institutions that we call 'Growth Accelerators,' some people call them 'innovators,' but these incubating places are where millennials are drawn and so we've now partnered with them and brought them into the SBA ecosystem." With the 2016 presidential election season underway, Contreras-Sweet said it is crucial for Latinos and millennials to understand the elements for a small business and entrepreneur to succeed. "The really important [and] powerful point to make here is that as we think about other countries like Greece [and] like Italy that have a flat-line population and thus they have a declining economy. You really want to embrace everybody to make sure that we maximize and optimize our productivity, per person," said Contreras-Sweet. "Latinos are a growing population, and so to the extent that we embrace them and we help them start their businesses, we can be more successful," continued the SBA administrator. Based on her recent travels across the U.S., Contreras-Sweet said Latinos have in their DNA the drive to start a trade. She also experienced the impact Latinas have made in the business sector. "We're very much inspired by the contributions Latinos are making to society today and especially Latinas. In Los Angeles for example, they told me that one-in-two new businesses that's starting is starting from a Latina, so it is very exciting to see the movement that Latinos are generating in terms of the entrepreneurial journey." "We (referring to overall Latinos) are more apt to start a business, and we're having great success," said Contreras-Sweet. Click here for the video version of Latin Post's Interview with SBA Administrator Maria Contreras-Sweet.